Superbikes are dream machines that fly past most of us on the highways during weekends. During one such group ride, the mighty Kawasaki Ninja ZX-14R bike broke down on the highway. A humble Royal Enfield came to the rescue of the sports tourer and pushed it through the highway. 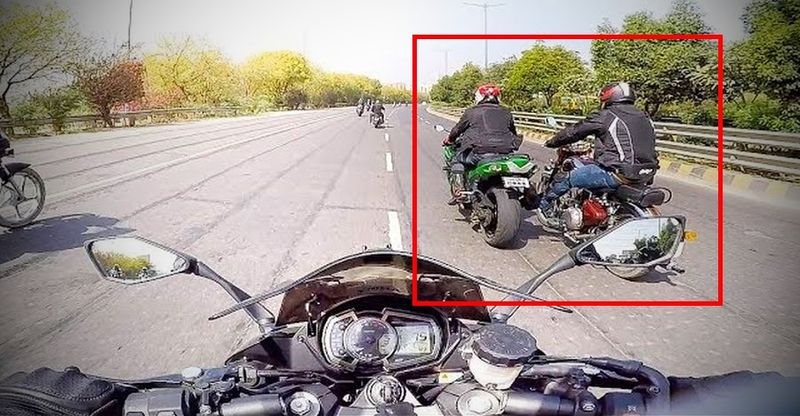 The video put up by Karan Sehgal on YouTube shows the whole meet-up and in the end, we can see a Royal Enfield Classic pushing the Kawasaki Ninja ZX-14R from the behind on the highway. According to the information available on the video, the Royal Enfield rider pushed the vehicle for around 100 km, which is quite a long distance, especially when you have to push a heavy vehicle by your leg. The video clip shows that the Royal Enfield rider has rested his left foot on the rear footpeg of the Kawasaki Ninja ZX-14R and is pushing it forward on the highway. While it is a rare sight on the road, we really have to appreciate the helping nature of the Royal Enfield rider who took the effort to push such a heavy and expensive motorcycle on the road. The exact details of the breakdown are now known but as per the video, the Ninja ZX-14R refused to start due to some problem. Also, the towing truck could not come to the spot on the Yamuna Expressway so they had to resort to bringing the bike to a safe place by pushing it. The exact details of the Royal Enfield are not known and it is also not known if it is the Classic 350 or Classic 500. The video shows that the Royal Enfield rider is pushing the bike at almost 75 km/h on the highway, which a good pace. The Kawasaki Ninja ZX-14R weighs a massive 270 kg plus the weight of the rider and the weight of the fuel and fluids like coolant, engine oil easily takes the overall weight of the bike to around 350 kg. The Royal Enfield Classic is not a lightweight machine either. It weighs close to 200 kg. However, the single-cylinder Unit Construction Engine (UCE) of the Royal Enfield is known for its concentrated low-end torque that can help the put heavy vehicles in motion. Once the vehicle starts moving, it becomes easier to push but it surely needs a lot of effort to use the leg to push such a heavy bike over a long distance. This is not the first time that a video of Royal Enfield pushing a heavier vehicle has been made. In the past, a Royal Enfield rider pushed a Hyundai Xcent to a fuel pump using a similar technique. The small sedan is definitely more much heavier and difficult to push than a superbike on the highway. Nonetheless, it was a great gesture of help by the Royal Enfield rider.